Thanksgiving is as American as apple pie and cornbread stuffing. Except that the United States is made up of so many cultures and people who have become part of the diverse landscape of the nation, and not everyone wants cranberry sauce, green bean casserole, and sweet potatoes topped with mini marshmallows. I know Italian families who serve baked ziti alongside their roast turkey, Filipino families who serve a big roast pig instead of the turkey, and Jewish families for whom kugel is a staple of their Thanksgiving menu. And so we wanted to ask some Israeli chefs: What do you serve for Thanksgiving? Their answers were surprising and delightful. Cheers to diversity and deliciousness, and have fun trying out some of these new takes on the holiday. Chef Einat Admony, of Taim Falafel, Balaboosta, and her newest venture, Kish Kash, serves this squash at home for Thanksgiving. But she has also been known to serve it in her restaurants during the autumn season. For an even more Thanksgiving-perfect twist, she suggests replacing the sesame seeds with pumpkin seeds and topping it with more pumpkin seeds and a sprinkling of smoked paprika. This recipe serves 4. Whisk together the oil, honey, salt, and pepper in a large bowl. Pick the leaves from the sprig of thyme and add them to the mixture. Cut the butternut squash into 1-inch thick cubes and toss them in the bowl along with the honey mixture. Mix well to coat evenly. 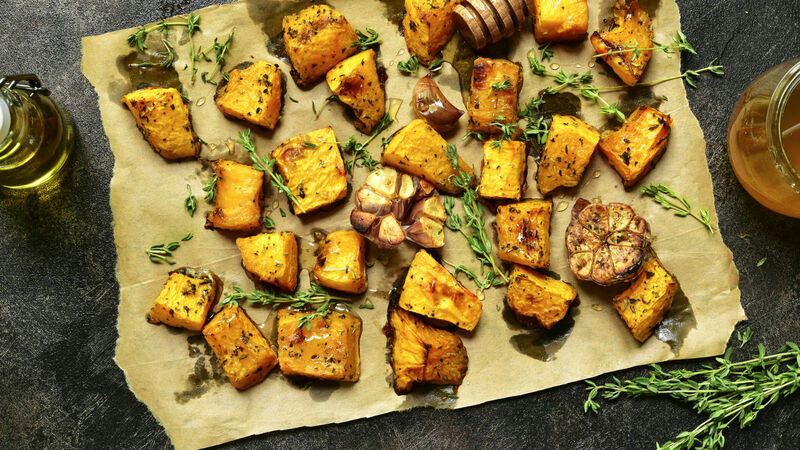 Line a baking sheet with parchment paper and place the butternut squash side-by-side in a single layer. Use a rubber spatula to scrape any remaining mixture from the bowl and drizzle it on top of the butternut squash. Bake them in the oven until tender and crispy about one hour. In a food processor fitted with a metal blade, add the tahini, garlic, lemon juice, water, and salt. Process the mixture for few minutes then add the rice vinegar, soy sauce, and honey. Process the mixture until smooth and creamy. Serve the roasted butternut squash on flat plate, drizzle tahini on top and garnish with sesame seeds. Chefy Meny Vaknin is known for his stellar pizzas, burekas, and other savory baked goods at Marcel Bakery in Montclair, New Jersey. These Turkish pizzas, or meat pies, are a filling and impressive appetizer to serve a hungry crowd. This will make 3 meat pies that can be cut into pieces and serve 4-6. In a large sauté pan heat up 1 Tbsp of olive oil and cook diced onions for few minutes. Add both meats and cook for 3-5 min more on medium-high heat. Break down the ground meat with a fork or wooden spoon while its cooking. Add the spices and herbs, check seasoning and cool down. Place all the ingredients in a mixer, adding the salt last and let it knead. For about 10 min or until the dough is smooth, cover and let it proof for about 30 min. After 30 min punch dough down and let it proof for another 30 min. Then divide the dough to 6 equal pieces, turn into bowls and let them rest, covered for another 30 min. Flatten each dough to about 8” diameter over a lightly floured surface. Spread cold meat mixture over the bottom and cover with another 8” flatten dough, then seal the edges with a fork. You’ll end up with 3 ‘pies’. Heat up a heavy bottom, 10-12” skillet for 5 min then lower flame to medium heat, put a table spoon of butter and a table spoon of canola oil, then carefully place pie inside and cook 4 min each side until golden brown and slightly crispy. Set each one on a plate with paper towel to soak access fat. Divide to 6 slices and serve with tzatziki sauce or tahini sauce. 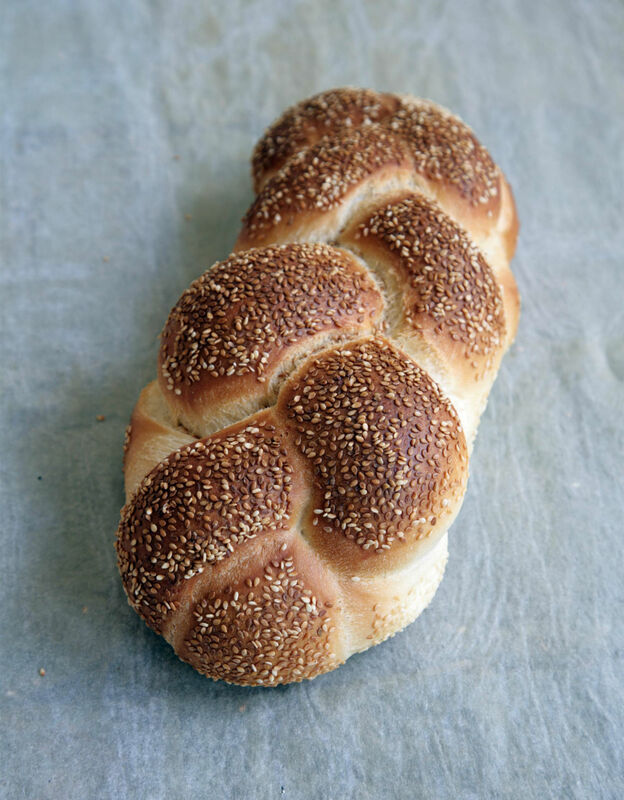 This stuffing recipe actually comes from Breads Bakery’s kitchen manager, Shaili Grosman, after she noticed that there was extra challah that wasn’t being used. As an Israeli, she had never tasted American-style stuffing before, but quickly understood what a great combination it was for this dish when the bakery’s co-owner Gadi Peleg suggested using the extra challah in this unique stuffing. This recipe serves 10-12 people. In a skilled over medium heat, sauté celery and onion in butter or oil. In a bowl, combine all ingredients together, adding just enough vegetable stock to moisten the mixture. Transfer to a baking dish (approx. 9 x 5″) and bake for 15 minutes or until dark golden brown on top. From kreplach to tayglach, these chefs keep it traditional and delicious.